Ski Holidays idea of our ski trips to Iran is to combine challenging and exciting skiing with strong travel experiences. As a rule, we travel in small groups led by Skiing instructor and mountain guides. We turn to experienced skiers; however we have skiing school for beginners too. Skiing in Iran is fantastic. Powder Snow, Big mountains and plenty of great skiing are waiting you. 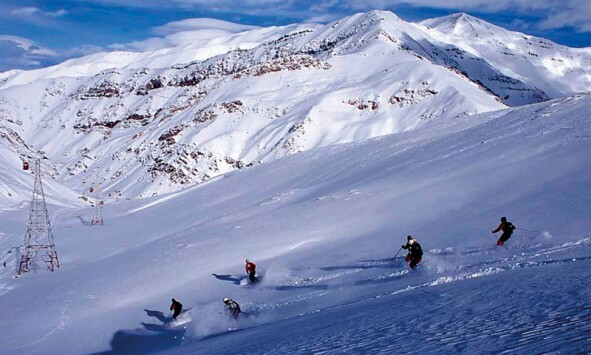 Skiing in Iran is one of the true skiing for enthusiasts. The skiing is very good because of the sunny days, good slopes and safe and fantastic off-piste skiing. Alborz that stretches from east to west and the Zagros, which have a route from northwest to southeast. Both Alborz and Zagros contain several peaks over 4,000 meters above the sea. The highest peak in Iran is Mount Damavand, 5671 meters above the sea. Several ski resorts are located in Alborz. Dizin and Shemshak areas, are located about three hours driving north of the Iran�s center, the capital Tehran. The prepared area consists mostly of gentle and safe slopes. Within reach of the lifts, there are several areas for those who like real good and safe off-piste skiing. You usually find sunny days and very good snow conditions in Dizin. 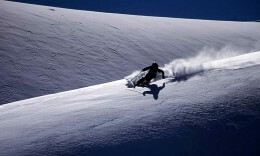 Our experienced guides secure many long and safe off-piste skiing.